You need a suitable gift for your loved one? Why not give away a motorcycle holiday in Andalucia? It's that simple! 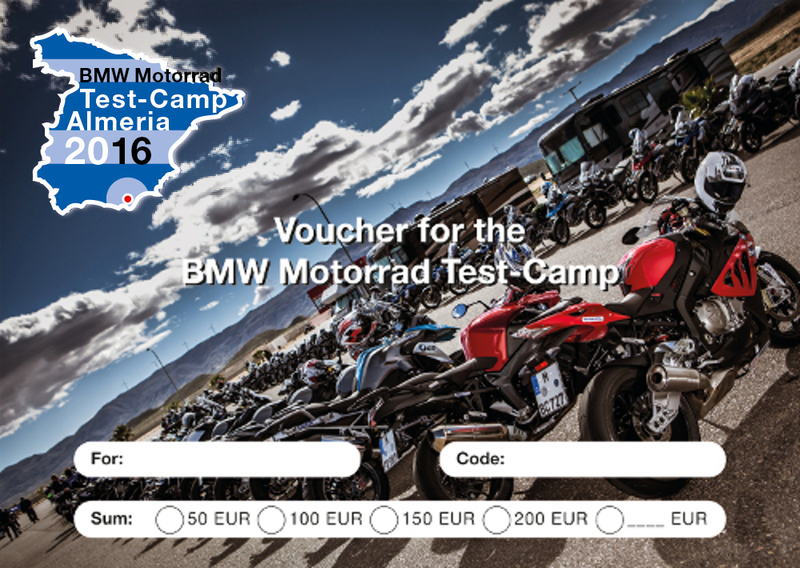 With the gift voucher for the BMW Motorrad Test-Camp you can prepare a great pleasure and send them on the bike under the warm Andalusian sun, while in Germany rules the cold winter. The voucher is the perfect choice not only as a Birthday, Christmas or Easter gift. Also to all other special occasions. You will receive a beautifully designed voucher whose use can be determined by the recipient itself. Whether he wants to drive on the circuit of Almeria, on the serpentines in Andalusia, on gravel roads or a combination of the variants. For almost every need, we have the right program. With the voucher you make for sure not only your loved ones happy, but also youself. At the latest when you will see the shine in the eyes of the recipient. And so it works: Fill out the form completely. Finished! Then you will receive the voucher by e-mail, on demand also by mail, and the code is usable immediately. Of course several vouchers can be redeemed at the same time, as long as the sum of the vouchers does not exceed the program amount. Should remain a balance, so of course this does not expire.